This time last year Team GB played out their best performance at an Olympic Winter Games since Chamonix 1924. The athletes were incredibly successful bringing home four medals from Sochi and propelling Winter Sports into the limelight. 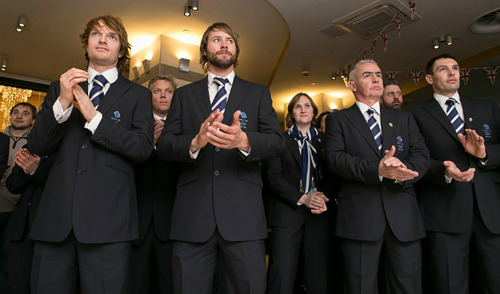 One year on, we talk to Oliver Brown Proprietor Kristian Robson on what is was like to partner with the British Olympic Association as the Official Formalwear Provider to Team GB for Sochi 2014. What were your first thoughts when it was confirmed that Oliver Brown would be providing the official formal wear for Team GB? I felt honoured and privileged; it was incredibly exciting to be a part of Team GB history and the biggest professional moment for Oliver Brown in our thirty year history. What was your inspiration for the design? The brief was to create pieces which showcased the best of British tailoring. It was important to stay true to Oliver Brown’s timeless signature style and source only pure, British fabrics. The collection comprised of bespoke navy blue suits, tailored to the traditional Oliver Brown ‘classic-fitted’ cut. Crafted from 100% wool, each jacket featured Team GB embroidery on the outside pocket and a Union Flag on the inner pocket. The finishing piece was a silk tie (for men) or scarf (for women) inspired by the Team GB logo. You provided more than 1100 items of formal wear to Team GBs delegation, what was the biggest challenge? We only had one fitting which meant we had just one chance to get it right, that was a lot of pressure. Team GB provided us with measurements for all the athletes and officials which we used to create the initial pieces. We travelled to Bath for the fitting and then made any necessary adjustments, before attending the ‘Kitting Out’ experience in Manchester to give every athlete their formalwear. What was your greatest moment? Can I choose two? Watching the entire Team GB delegation, including HRH Princess Anne and Lord Coe, dressed in Oliver Brown at the reception dinner in Sochi. It was also a very proud moment to see the athletes wearing Oliver Brown as they returned with their medals and visited 10 Downing Street. Favourite sporting event at Sochi 2014? Being half Norwegian, my favourite had to be the Cross Country! All of the Team GB performances were very exciting to watch and to see Team GB perform so brilliantly made you feel incredibly proud.